Image courtesy of the author. Photo credit Tracy Kerin Prell. ​My professional experience with STEAM is primarily through informal education. I was deeply inspired by the San Francisco Exploratorium when I visited as a teenager – the hands-on and open-ended nature of their exhibits, their “homemade” look, their… their… well, there was something else that struck a chord that I couldn’t put my finger on. They had something so different from any science museum I’d seen previously, that the chord it struck in me kept resonating. Years later, after gaining a Ph.D. in Geological Oceanography and going to work for the New England Aquarium (Boston), I found out that the Exploratorium was a bit of a holy grail in the museum world as well. They attracted and interested people of all ages – young children, teens, young adults, and older adults both with and without children. What was that secret sauce that appealed to so many? "Art is included, not just to make things pretty, although it often does so, but primarily because artists make different kinds of discoveries about nature than do physicists or geologists. They also rely on a different basis for decision-making while creating their exhibits. But both artists and scientists help us notice and appreciate things in nature that we had learned to ignore or had never been taught to see. Both art and science are needed to fully understand nature and its effects on people." This idea of combining science and art in a museum setting was revolutionary in 1969. Unfortunately it was still revolutionary in 2008, when I left the Aquarium and took a leave of absence from the world of science content, exhibit design, and informal education to raise my two children. Rhode Island, my adopted home state, had a world famous school of art and design, many excellent research institutions, and nothing even close to the Exploratorium. 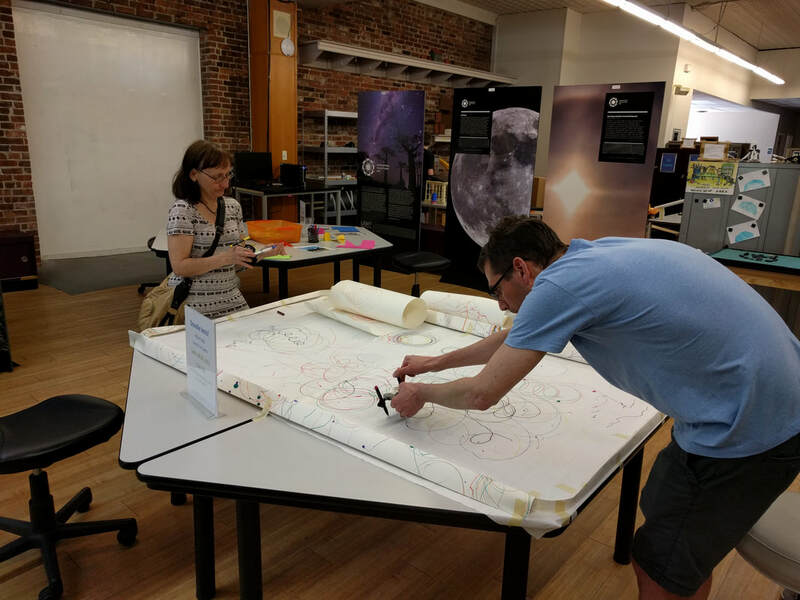 So, with the help of a dedicated group of scientists, artists, educators, an accountant, business people, and more, we started the Rhode Island Museum of Science and Art (RIMOSA). And we were regularly met with confusion. Some potential funders couldn’t comprehend how science and art could possibly be combined. Would it involve a model of a coral reef ecosystem and then some artwork by Gaugin? Even visitors interacting with our exhibits would periodically ask “I see the science here, but where’s the art?” Or vice versa – they saw the art but not the science - occasionally with the same exhibit. We would even argue about it among ourselves, parsing each program into the art part and the science part the way a parent might divide their child into an assemblage of traits they got from “my side” or “your side” – completely forgetting the child or the experience as a whole. To solve our problem, we went back to the beginning. RIMOSA’s mission was to create exhibits and programs – for older children and adults - that emphasized the traits shared by both artists and scientists; the ability to observe, the courage to experiment, the need to communicate and, above all, an insatiable curiosity. If we refused to accept a line of demarcation between science and art, and saw them simply as different expressions of the same curious and inventive minds, then we could stop trying to divide up our programs to be sure that they had enough discrete examples of “science” and “art.” The science and the art would be the same thing – the creative problem solving that serves as a foundation for both. This is the secret to STEAM. It is not necessary to go through activities or exhibits with a checklist to ensure that Science, Technology, Engineering, Art, and Math are all present. STEAM is less about the disciplines themselves than it is about the process at the root of these disciplines. STEAM theory accentuates process over the accumulation of facts. RIMOSA’s exhibits and programs are hands-on and open-ended – their goal is not to transmit any particular piece of information, but to introduce and familiarize participants to the feeling of creativity. For example, our “Rube Goldberg/Marble Roller Coaster” program introduces Rube Goldberg the person – trained as an engineer, famous for his tongue-in-cheek cartoons. We show a few video examples of real Rube Goldberg machines made by both amateurs and professionals, noting how much trial and error is involved. Then we simply back up and let the groups take supplies and work together to make something that pleases them. No one has ever tried to replicate what they have seen in the film examples (we don’t even have the same materials) and I have never seen the same thing twice. Do they know the difference between potential and kinetic energy? Do they remember who Rube Goldberg was? They will if it strikes a chord with them, although that isn’t our focus. What we hope they will remember is the feeling of working as a group to create something fantastic. How satisfying it was to a participant when she explained her concept and the group liked her idea, the feeling of problem solving when she figured out why the marble wouldn’t stay on the track, how he realized that someone had a good plan to correct a problem and they worked together to fix it – and the thrill when it did what he wanted it to (or the joy when it didn’t, but accidentally was even better!). We want them to take these feelings and experiences into the rest of their lives and replicate them. Unlike STEM challenges, which tend to focus on competition (build the fastest, tallest, strongest etc. ), STEAM activities focus more on creativity. There is no first, second, and third place because it isn’t a competition. In the Rube Goldberg/Marble Roller Coaster instance above, for example – who wins? Open ended activities have no set end point, so an almost infinite number of results are acceptable. Participants admire their own work, and make note of good ideas when they appear in the work of others. Those who are more science-minded may experience this program and think “Why does that happen?” while the more art-minded may see the same thing and think “How can I use that?” RIMOSA offers the seeds, and how they take root in peoples’ minds is up to them. 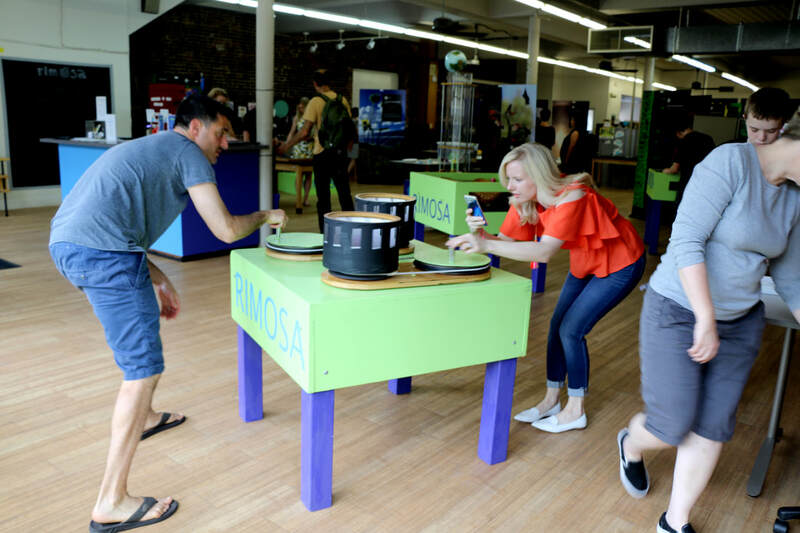 Although RIMOSA isn’t the first museum to install open-ended exhibits, RIMOSA is one of the few interactive museums to explicitly make the merging of science and art - STEAM - integral to its existence. We are immensely proud of what we have made. Perhaps one of our visitors, upon visiting our museum, will be deeply inspired and it will strike a chord that will continue to resonate. And we cannot wait to see what they will go on to create. Bonnie Epstein received her undergraduate degree in Geology/Biology from Brown University and her Ph.D. in Geological Oceanography from the University of Rhode Island. Her interests lie at the junction of science, art and education. She founded and works as the Executive Director of the Rhode Island Museum of Science and Art (RIMOSA), a hands-on, interactive museum designed to inspire curiosity and encourage experimentation in older children and adults. She also teaches design-solution based geology courses at the Rhode Island School of Design.